Play like a Gladiator between the sticks in this Storelli ExoShield Gladiator Goalkeeper Shirt in a Strike and Black colourway. When your position on the football pitch is a goalkeeper you have to be pretty fearless as diving saves and taking a battering come as part of your game. It is vital that you feel the part when you wear this shirt as it can give you confidence and fearless mentality of a gladiator whilst making you stand out in the style stakes too. Gladiators wore iconic armory known as the "Galerus" which was a distinctive metal body guard which isolated and liberated the arms ready for battle. This idea was used and crafted in conjunction with this goalkeeper shirt to bring about that fearless nature. 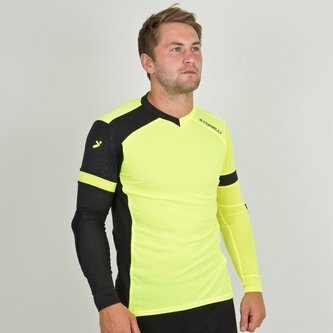 This shirt has been crafted and enhanced with ant-bacterial treatment to reduce germs and odors whilst being armored with material that absorbs up to 90% of impact. Furthermore, it employs lightweight materials that wick moisture away from the body. Durable, textured shield covers and a locker loop.